This large studio of 28 m2 is located on a quite courtyard, rue du Temple near Square du Temple and rue de Bretagne. First floor via stairs. Open plan lounge/fully equipped kitchen with fold away dining table, sofa-bed, flat screen television, DVD, stereo and computer. Double bed or two single beds, large closets, washing machine and two windows facing the courtyard. Tiled bathroom with shower. Located on rue de Temple in the Le Marais, a few steps from rue de Bretagne with grocery stores and open food market, Mus�e Picasso and Place des Vosges. Art galeries, fashion boutiques, caf�s, bistrots and restaurants. 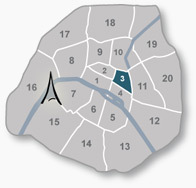 10-15 min walk to Centre Georges Pompidou, Notre Dame de Paris, Ile de la Cite and Ile St-Louis. Place de la Republique with several metro lines brings you quickly all around in Paris. Open plan living room/fully equiped kitchen with oven, microwave,vitro-ceramic cooker top, fridge/freezer, extractor fan. Two windows facing the courtyard, living area with folding dining table for 2 with 2 folding chairs, sofa-bed, flat screen TV, DVD, phone and computer with internet connection. Bedroom area with doublebed which can be made up as two single beds. Large closet space. Tiled bathroom with washbasin, shower and WC. The apartment is situated on rue du Temple just opposite the lovely park Square du Temple and at the top of the very trendy rue de Bretagne.